Michigan Trail Riders Assoc., Inc. The MTRA wants to help you enjoy the sport of horseback riding and your love of the outdoors in a unique way, by riding the Michigan Shore-to-Shore Riding/Hiking Trail. This trail provides nearly unlimited riding in wilderness areas and provides a way across the state of Michigan through the more civilized areas. Families from all over Michigan, as well as other states and Canada, have joined the MTRA. They come from all walks of life but they share an interest in horses and the out-of-doors. 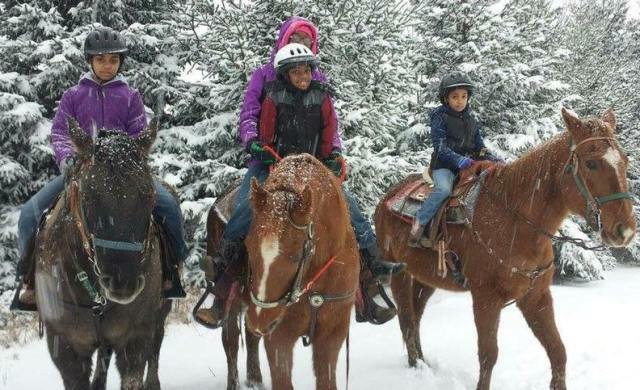 As a non-profit corporation, the MTRA is financed thru membership and trail ride fees. All money which is not used to sponsor the many yearly organized rides is earmarked for camp and trail projects. Twice yearly, in spring and late summer, a Work Bee is held so that all members can contribute their labor and use of their equipment to help build, maintain, or repair camps and trails. The MTRA has always been blessed with active, working members, whose efforts are responsible for the perpetuation of the priceless gift of the Michigan Shore-to-Shore Riding/Hiking Trail. This institution is an equal opportunity provider. It is operated under special use permit with the Huron-Manistee National Forest and the Michigan Department of Natural Resources.